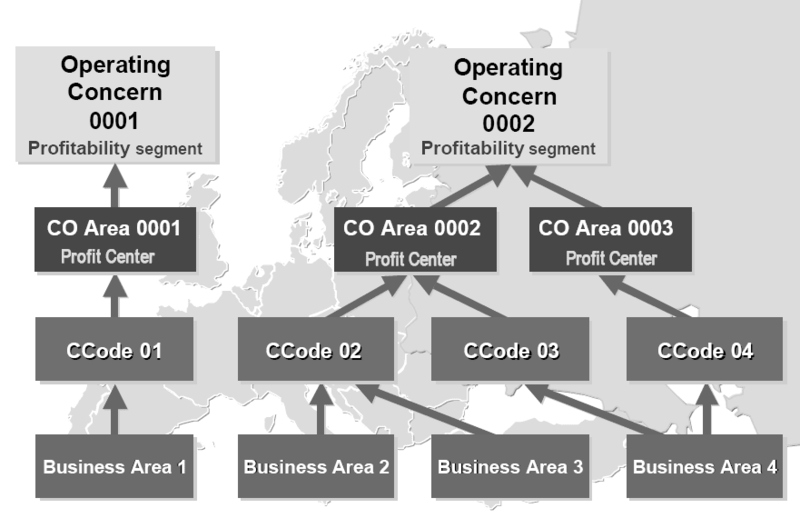 The business scenario for extracting the data from SAP BW is as explained below.The ABC Company has implemented CO-PA and wants to use this data in the SAP Business Information Warehouse to compile reports for the management.The management requires analyses of the gross and net sales figures from the individual sales organizations.You are responsible for extracting the data from the R/3 System and importing it into BW. To do so, you have to create the necessary components in the R/3 and BW Systems. The integrated cross-application reporting concept is n ot as differentiated as in the SAP BW.The OLTP System is optimized for transaction processing, and a high reporting load would impact the overall performance of the system.Using BW as a reporting solution for CO-PA eliminates these problems. During billing in SD, revenues and discounts are transferred to profitability segments in Profitability Analysis. 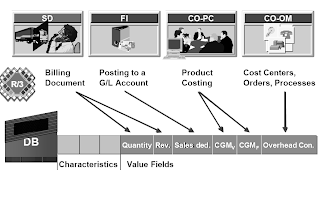 At the same time, sales quantities are valuated using the standard cost of goods manufactured, as specified in the cost component split from CO-PC.In Overhead Cost Controlling, primary postings are made to objects in Overhead Cost Controlling and assigned to the relevant cost object on a source-related basis. The actual cost of goods manufactured is also assigned to the cost object. At the same time, the performing cost centers are credited. 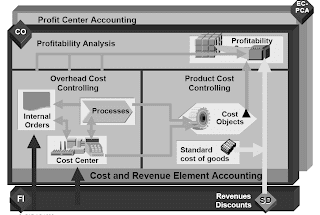 From the point of view of profitability analysis, this leads to under or over absorbtion of the performing cost centers and to production variances for the cost objects involved (such as production orders). The production variances calculated for the cost objects (in this case, production orders), i.e. 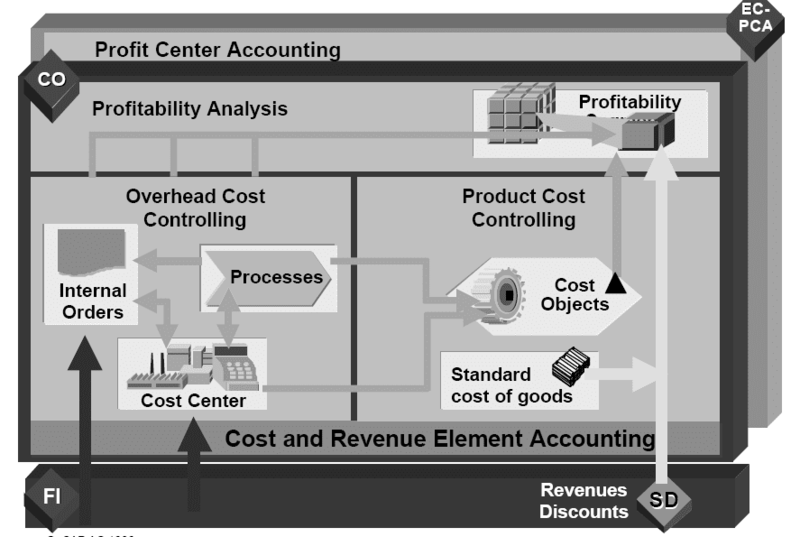 the difference between the actual cost of goods manufactured and the standard costs, are divided into variance categories and settled to profitability segments. The overhead costs remaining for the objects in Overhead Cost Controlling are assigned to the source profitability segments.What are the top products and customers in our different divisions? This is just one of the typical questions that can be answered with the Profitability Analysis (CO-PA) module. The wide variety of analysis and planning functions in CO-PA allow you to plan, monitor, and control the success of your company in terms of product-oriented, customer-oriented and organizational dimensions of multidimensional profitability segments. Characteristics:Characteristics are levels on which information is required. Characteristic values:Characteristic values are values that can be assumed by a characteristic. Profitability segment :A profitability segment is a combination of existing characteristic values. 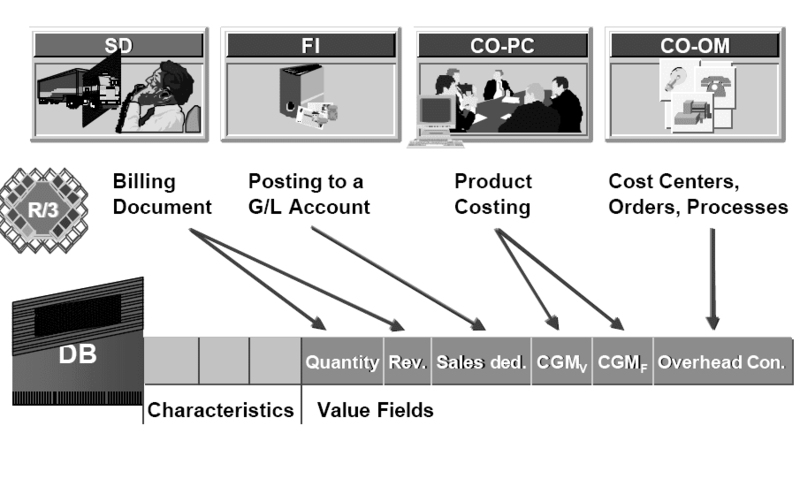 Characteristics are the fields in an operating concern according to which the data can be differentiated in Profitability Analysis.Each characteristic in an operating concern has a series of valid characteristic values.A profitability segment is a fixed combination of valid characteristic values. Some characteristics are predefined in each operating concern. This includes customer, material, company code, and others. You can call up a full list of the fixed characteristics by displaying the data structures in the operating concern.In addition to these fixed characteristics, you can define up to 50 of your own characteristics. In most cases, you will be able to satisfy your profitability analysis requirements with between 10 and 20 characteristics. Descriptive attributes (customer, material, time) are stored as characteristics so that the data can be analyzed according to several dimensions.In addition to the independent characteristics which can be found on a sales document (customer, material, fiscal period, sales area, etc. ), several characteristics can be derived from these (customer group, material hierarchy, sales hierarchy). When costs are posted from CO-OM, the most detailed characteristics are usually initial values (blank or zero) since the costs can only be properly assigned to objects that are less detailed. Marketing costs, for example, could be correctly assigned to the customer group and the article. that are used to record different cost elements (e.g. marketing costs) are not equal to zero in these data records. The value fields and characteristics that are required to conduct detailed analyses of the contribution margin vary considerably both from industry to industry and between individual customers. 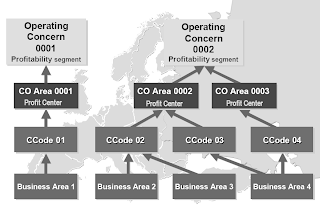 In COPA, therefore, you can configure the structure of one or more operating concerns in each individual installation. An operating concern is an organizational structure that groups controlling areas together in the same way as controlling areas group companies together. Each installation usually comprises only one operating concern. Since value fields and characteristics can be defined individually in each customer installation, it is not possible to ship all of the required data structures (and the programs for accessing these structures) with the R/3 installation CD. Instead, these structures have to be generated when CO-PA is configured (similar to an Info Cube in BW). fields and characteristics and, therefore, are generated tables. Line items contain some information at document level (CO-PA document number, sales document number, posting date) that, in most cases, is too detailed for analysis purposes. CO-PA maintains an initial stigmatization of the data used by all CO-PA functions (reporting, planning, assessments, settlements, realignments, etc.). The characteristics that describe the market are first separated from the rest of the line items. 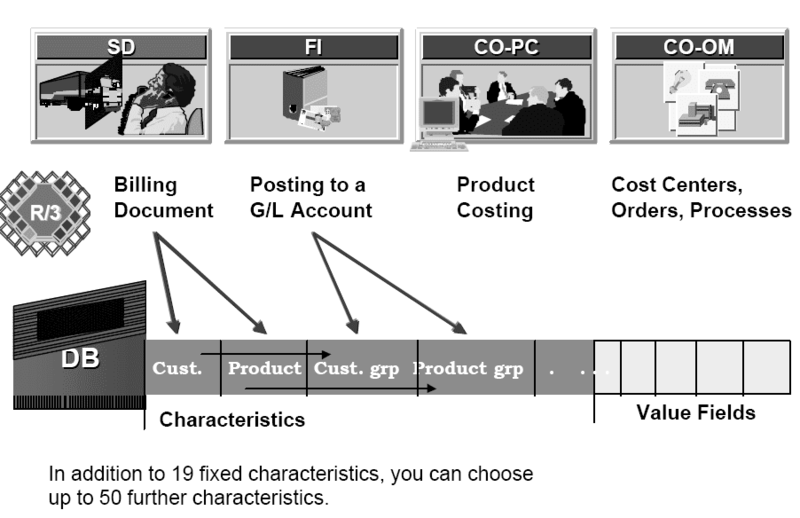 Each combination of characteristic values is coded in a profitability segment number. The link between the profitability segment number and characteristic values is maintained in a separate table - the segment table CE4xxxx. Certain characteristics can be excluded from this process. These are then stored in the line items only and not in the segment table. These characteristics can only be analyzed to a limited extent. Characteristics that are differentiated to a large extent (such as the customer order number) are usually excluded to reduce the volume of data. 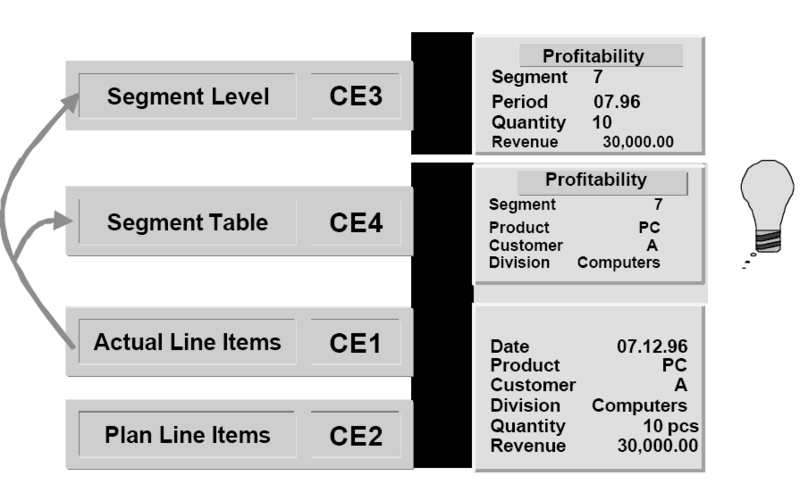 The value fields are summarized at the profitability segment and period levels (as well as other characteristics at the business transaction level: plan/actual indicator, record type, and plan version) and stored together with these fields in a second table known as the segment level CE3xxxx. This table contains the total values of the period for each profitability segment number. You can compare an operating concern (which is represented by the associated segment table and segment level) with an Info Cube. The Info Cube comprises a dimension table (the segment table) and a fact table (the segment level). Unlike the fact table of an Info Cube, the segment level key contains other keys (e.g. the record type) in addition to the key field from the segment table. Characteristics in CO-PA correspond to the characteristics (or attributes) in Info Cubes; the value fields can be regarded as key figures with an additional summarization in each characteristic.Summarization levels for an operating concern have the same function as aggregates for an Info Cube. The only difference is that aggregates for Info Cubes are managed with the Info Cube itself (i.e. all aggregates always contain the same numbers as the Info Cube they are based on), while summarization levels are updated at regular intervals (usually every day). Line items in CO-PA can be compared with the line items in the Operational Data Store (ODS). These are also comparable with line items in the communication structure directly before they are posted to an Info Cube.